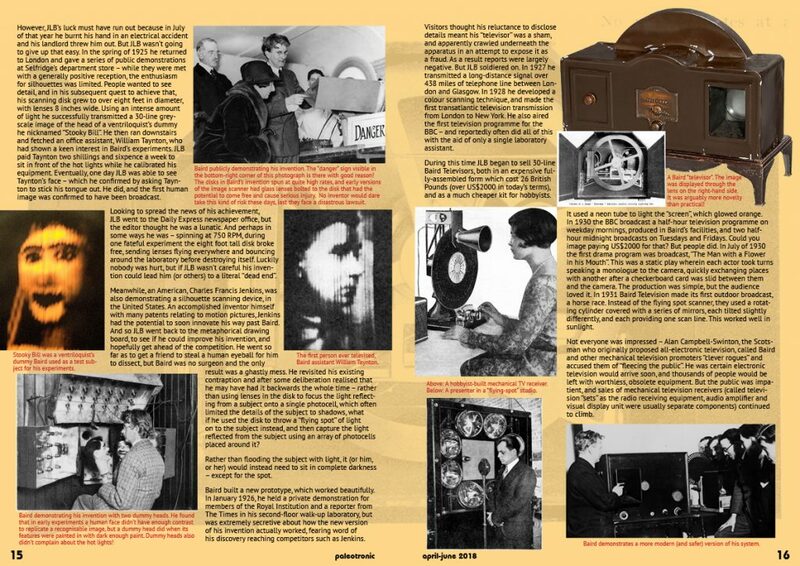 How John Logie Baird set the stage for the advent of widespread television. 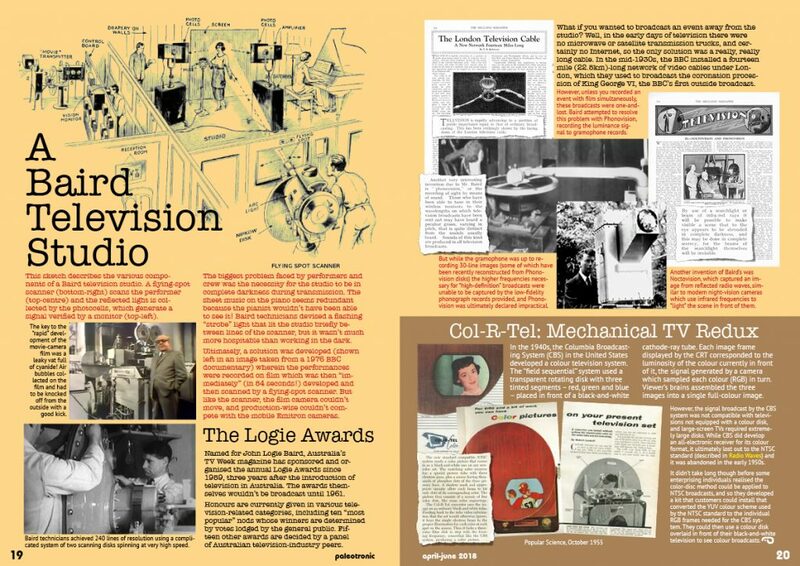 Going a different way: long before Philo T. Farnsworth and David Sarnoff duked it out in the United States, a Scotsman had already been driving his idea of the future of television far away in another direction – a mechanical one. John stood there, on the cliffs above the shoreline near Hastings, on the south coast of England, gazing out at the ocean, and sighed. He was cold, tired and generally miserable. He was always cold, tired and generally miserable. He didn’t expect an answer. After all, he had always pulled himself up by his own under-socks (ha ha) – born in Scotland in 1888, John had grown up in the small fishing village of Helensburgh, the son of a church minister. He had three older siblings so he was far from doted upon, despite being sickly and frail. He hated the emphasis society placed on physical activities like sport and fighting and war, and looked up to technologies that enhanced the human experience, like motorcars, telephones and cameras – one of the latter he bought with pocket money carefully squirrelled away. When he was twelve he strung telephone wires between his house and the homes of four of his friends, but was forced to take them down after a horse-bus driver had his hat knocked off. But he wasn’t discouraged, and in his thirteenth year he built a generator – his house was the only one in the village to have electric lighting! He was constantly dreaming about how not just to improve his own frustrating life, but the lives of people in general. When he was eighteen, John Logie Baird – or JLB as he was known to his friends – went to Glasgow to study engineering. It took him eight years to finish, because he was often too unwell to attend classes. When World War I started, he tried to join the army, but was declared unfit, and was forced to work in a factory instead, where he found the work tiresome and he swore he would invent something – something that would provide him with a happy life. Then there was the socks, which did well, and then the other things, which did not. And there JLB was, standing on the Hastings shore in early 1923 at the age of thirty-five, desperate for an idea – any idea! Manual labour was not for him, he only had his mind, with which he pleaded to provide an answer to his query: what do I do now? Perhaps by revisiting some of his failed inventions he could divine how to improve them, or maybe they would provide an inspiration for something new. He flipped through his mental scrapbook – we won’t embarrass JLB by recounting the details of his more outlandish exploits (although there was that attempt at making a flying machine that crashed into his mother’s garden – with him in it, and who could forget his homemade haemorrhoid cream? He sure couldn’t! ), but instead we’ll just skip right to the end of his internal parade of personal disasters. When John was a teenager, one of the things he dreamt of was the ability to “see” radio – that is, a radio that received and displayed a moving picture, as well as sound. But at the time it was pure science fiction – there wasn’t even a place to start. Maybe that had changed? If he could make it work, there would certainly be money in it – he was sure of it. JLB walked back into Hastings and went to the library, where he did a little research. He learned of two important inventions of which his teenage self had been unaware. The first was the Nipkow disk. Invented by a German, Paul Gottlieb Nipkow in 1884, his disk was perforated by a series of offset holes. As the disk spun, an image displayed through it was visibly broken up into a series of lines. In theory you could read the image with an “electric eye” and reconstruct it with a light bulb and another disk. If you had an “electric eye”, of course. Which leads us to the second invention. Previous “electric eyes” – or photocells, which can electrically measure light – were too weak to have any usefulness, as they required extreme amplification. But between 1902 and 1907 German scientist Arthur Korn invented signal-conditioning circuits that improved the output from photocells, removing the necessity for high voltages and enabling him to send still images over the radio and telephone. JLB was easily able to put the two together, and excitedly rushed off to acquire the needed parts for a prototype – but on a budget. From various Hastings shops he scrounged an old tea chest, a bicycle lamp and a few lenses, a cookie tin, a hat box, glue, string, darning needles, scissors and sealing wax. With these items, and the aid of an old school friend and current house-mate Guy Robertson (known as “Mephy”), he built a rudimentary Nipkow scanner, with lenses in the holes of the disc which focussed the light from a subject in front of it on to a point behind it. John used the motor from an old electric fan to spin it. Confident he could make it work with a bit of additional assistance, he posted an advertisement in The Times of London seeking help developing his invention. The Chief Engineer of the British Broadcasting Corporation (BBC) saw Baird’s posting and went down to Hastings to visit him, subsequently sending some much-needed equipment. After that, JLB acquired the remaining electronic components needed for his apparatus, including a photocell, and began to work out the finer details. His father read of his experiments and sent him fifty pounds, which he used to rent a workshop. He was also contacted by Will Day, a London cinema owner, and together they formed a partnership and applied for a preliminary patent on Baird’s invention in mid-1923. Excited, JLB wrote to a friend that he had “invented a means of seeing by wireless” to which his friend responded that he should’ve stuck to soap. JLB was undeterred. With the assistance of local radio shop owner Victor Mills, he developed a prototype that transmitted (by wire, which required electronic motor synchronisation of the scanning and the display disks – no small feat) and reproduced a silhouette of a cardboard-cutout Maltese cross. Despite the contraption being somewhat dangerous as the lenses were prone to break free from the scanning disk at high speed, JLB demonstrated it for British publication the Radio Times in early 1924 – luckily it all held together. However, JLB’s luck must have run out because in July of that year he burnt his hand in an electrical accident and his landlord threw him out. But JLB wasn’t going to give up that easy. In the spring of 1925 he returned to London and gave a series of public demonstrations at Selfridge’s department store – while they were met with a generally positive reception, the enthusiasm for silhouettes was limited. People wanted to see detail, and in his subsequent quest to achieve that, his scanning disk grew to over eight feet in diameter, with lenses 8 inches wide. Using an intense amount of light he successfully transmitted a 30-line greyscale image of the head of a ventriloquist’s dummy he nicknamed “Stooky Bill”. He then ran downstairs and fetched an office assistant, William Taynton, who had shown a keen interest in Baird’s experiments. JLB paid Taynton two shillings and sixpence a week to sit in front of the hot lights while he calibrated his equipment. Eventually, one day JLB was able to see Taynton’s face – which he confirmed by asking Taynton to stick his tongue out. He did, and the first human image was confirmed to have been broadcast. Looking to spread the news of his achievement, JLB went to the Daily Express newspaper office, but the editor thought he was a lunatic. And perhaps in some ways he was – spinning at 750 RPM, during one fateful experiment the eight foot tall disk broke free, sending lenses flying everywhere and bouncing around the laboratory before destroying itself. Luckily nobody was hurt, but if JLB wasn’t careful his invention could lead him (or others) to a literal “dead end”. Meanwhile, an American, Charles Francis Jenkins, was also demonstrating a silhouette scanning device, in the United States. An accomplished inventor himself with many patents relating to motion pictures, Jenkins had the potential to soon innovate his way past Baird. And so JLB went back to the metaphorical drawing board, to see if he could improve his invention, and hopefully get ahead of the competition. He went so far as to get a friend to steal a human eyeball for him to dissect, but Baird was no surgeon and the only result was a ghastly mess. He revisited his existing contraption and after some deliberation realised that he may have had it backwards the whole time – rather than using lenses in the disk to focus the light reflecting from a subject onto a single photocell, which often limited the details of the subject to shadows, what if he used the disk to throw a “flying spot” of light on to the subject instead, and then capture the light reflected from the subject using an array of photocells placed around it? Rather than flooding the subject with light, it (or him, or her) would instead need to sit in complete darkness – except for the spot. Baird built a new prototype, which worked beautifully. In January 1926, he held a private demonstration for members of the Royal Institution and a reporter from The Times in his second-floor walk-up laboratory, but was extremely secretive about how the new version of his invention actually worked, fearing word of his discovery reaching competitors such as Jenkins. Visitors thought his reluctance to disclose details meant his “televisor” was a sham, and apparently crawled underneath the apparatus in an attempt to expose it as a fraud. As a result reports were largely negative. But JLB soldiered on. In 1927 he transmitted a long-distance signal over 438 miles of telephone line between London and Glasgow. In 1928 he developed a colour scanning technique, and made the first transatlantic television transmission from London to New York. He also aired the first television programme for the BBC – and reportedly often did all of this with the aid of only a single laboratory assistant. During this time JLB began to sell 30-line Baird Televisors, both in an expensive fully-assembled form which cost 26 British Pounds (over US$2000 in today’s terms), and as a much cheaper kit for hobbyists. It used a neon tube to light the “screen”, which glowed orange. In 1930 the BBC broadcast a half-hour television programme on weekday mornings, produced in Baird’s facilities, and two half-hour midnight broadcasts on Tuesdays and Fridays. Could you image paying US$2000 for that? But people did. In July of 1930 the first drama program was broadcast, “The Man with a Flower in his Mouth”. This was a static play wherein each actor took turns speaking a monologue to the camera, quickly exchanging places with another after a checkerboard card was slid between them and the camera. The production was simple, but the audience loved it. In 1931 Baird Television made its first outdoor broadcast, a horse race. Instead of the flying spot scanner, they used a rotating cylinder covered with a series of mirrors, each tilted slightly differently, and each providing one scan line. This worked well in sunlight. Not everyone was impressed – Alan Campbell-Swinton, the Scotsman who originally proposed all-electronic television, called Baird and other mechanical television promoters “clever rogues” and accused them of “fleecing the public”. He was certain electronic television would arrive soon, and thousands of people would be left with worthless, obsolete equipment. But the public was impatient, and sales of mechanical television receivers (called television “sets” as the radio receiving equipment, audio amplifier and visual display unit were usually separate components) continued to climb. In 1932, the BBC launched its own studio. At its inaugural broadcast, the BBC inexplicably snubbed Baird, forcing him to stand with the press, and giving him no credit for his part in the enterprise. In response, Baird opened an expansive television production facility in 1933, under the 92,000 square metre Crystal Palace, a cast-iron and plate-glass structure originally constructed for the Great Exhibition of 1851, in London. It had smaller studios equipped with flying spot scanners, and three large studios which used film cameras. Film could be developed at leisure and broadcast later, but due to the concerns of cinema owners (who didn’t want competition in the “pre-recorded” space) and the novelty of “live” broadcasts, Baird developed a machine that could expose, develop, scan and transmit film in 54 seconds from start to finish. Film would go straight out of the camera and into a cyanide tank for developing, which would often leak, and actresses were known to drag the hems of their gowns through cyanide puddles on their way into the studio. 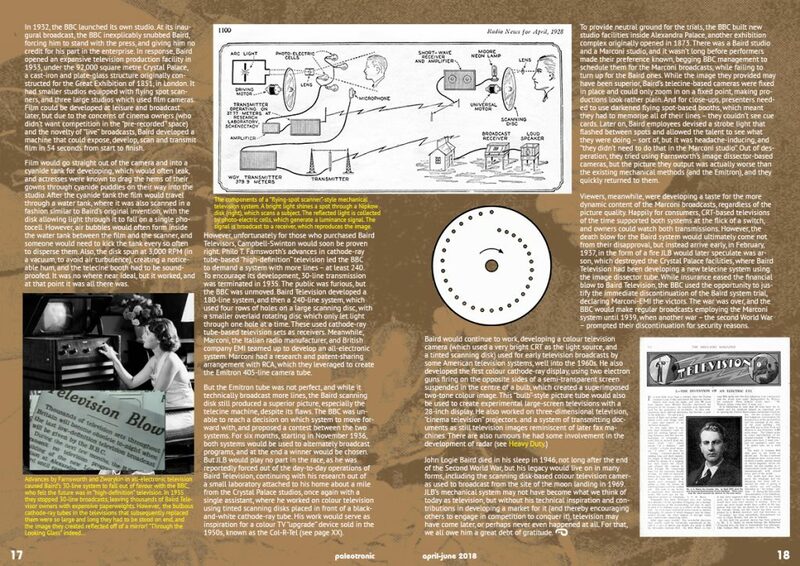 After the cyanide tank the film would travel through a water tank, where it was also scanned in a fashion similar to Baird’s original invention, with the disk allowing light through it to fall on a single photocell. However, air bubbles would often form inside the water tank between the film and the scanner, and someone would need to kick the tank every so often to disperse them. Also, the disk spun at 3,000 RPM (in a vacuum, to avoid air turbulence), creating a noticeable hum, and the telecine booth had to be soundproofed. It was no where near ideal, but it worked, and at that point it was all there was. However, unfortunately for those who purchased Baird Televisors, Campbell-Swinton would soon be proven right. Philo T. Farnsworth’s advances in cathode-ray tube-based “high-definition” television led the BBC to demand a system with more lines – at least 240. To encourage its development, 30-line transmission was terminated in 1935. The public was furious, but the BBC was unmoved. Baird Television developed a 180-line system, and then a 240-line system, which used four rows of holes on a large scanning disc, with a smaller overlaid rotating disc which only let light through one hole at a time. These used cathode-ray tube-based television sets as receivers. Meanwhile, Marconi, the Italian radio manufacturer, and British company EMI teamed up to develop an all-electronic system. Marconi had a research and patent-sharing arrangement with RCA, which they leveraged to create the Emitron 405-line camera tube. But the Emitron tube was not perfect, and while it technically broadcast more lines, the Baird scanning disk still produced a superior picture, especially the telecine machine, despite its flaws. The BBC was unable to reach a decision on which system to move forward with, and proposed a contest between the two systems. For six months, starting in November 1936, both systems would be used to alternately broadcast programs, and at the end a winner would be chosen. But JLB would play no part in the race, as he was reportedly forced out of the day-to-day operations of Baird Television, continuing with his research out of a small laboratory attached to his home about a mile from the Crystal Palace studios, once again with a single assistant, where he worked on colour television using tinted scanning disks placed in front of a black-and-white cathode-ray tube. His work would serve as inspiration for a colour TV “upgrade” device sold in the 1950s, known as the Col-R-Tel. To provide neutral ground for the trials, the BBC built new studio facilities inside Alexandra Palace, another exhibition complex originally opened in 1873. There was a Baird studio and a Marconi studio, and it wasn’t long before performers made their preference known, begging BBC management to schedule them for the Marconi broadcasts, while failing to turn up for the Baird ones. While the image they provided may have been superior, Baird’s telecine-based cameras were fixed in place and could only zoom in on a fixed point, making productions look rather plain. And for close-ups, presenters needed to use darkened flying spot-based booths, which meant they had to memorise all of their lines – they couldn’t see cue cards. Later on, Baird employees devised a strobe light that flashed between spots and allowed the talent to see what they were doing – sort of, but it was headache-inducing, and “they didn’t need to do that in the Marconi studio”. Out of desperation, they tried using Farnsworth’s image dissector-based cameras, but the picture they output was actually worse than the existing mechanical methods (and the Emitron), and they quickly returned to them. Viewers, meanwhile, were developing a taste for the more dynamic content of the Marconi broadcasts, regardless of the picture quality. Happily for consumers, CRT-based televisions of the time supported both systems at the flick of a switch, and owners could watch both transmissions. However, the death blow for the Baird system would ultimately come not from their disapproval, but instead arrive early, in February, 1937, in the form of a fire JLB would later speculate was arson, which destroyed the Crystal Palace facilities, where Baird Television had been developing a new telecine system using the image dissector tube. While insurance eased the financial blow to Baird Television, the BBC used the opportunity to justify the immediate discontinuation of the Baird system trial, declaring Marconi-EMI the victors. The war was over, and the BBC would make regular broadcasts employing the Marconi system until 1939, when another war – the second World War – prompted their discontinuation for security reasons. 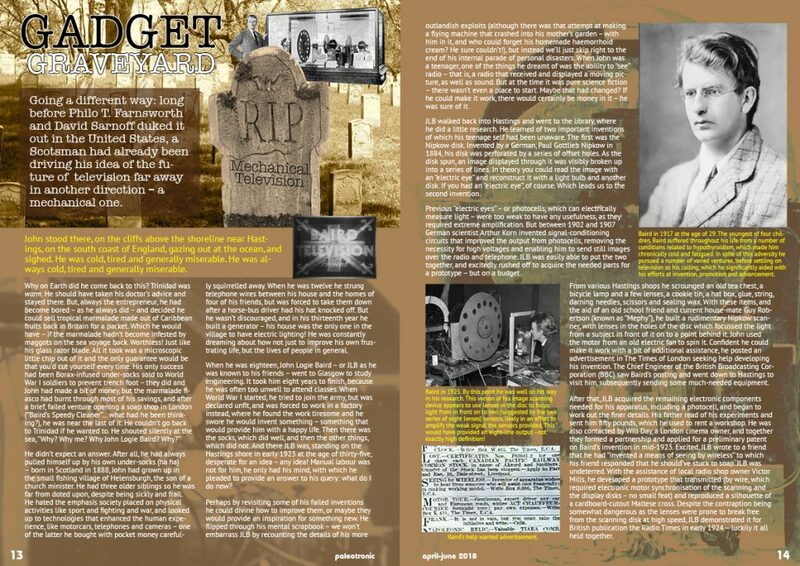 John Logie Baird died in his sleep in 1946, not long after the end of the Second World War, but his legacy would live on in many forms, including the scanning disk-based colour television cameras used to broadcast from the site of the moon landing in 1969. JLB’s mechanical system may not have become what we think of today as television, but without his technical inspiration and contributions in developing a market for it (and thereby encouraging others to engage in competition to conquer it), television may have come later, or perhaps never even happened at all. For that, we all owe him a great debt of gratitude.